The Frank Lloyd Wright of desserts tells us what he’s loving right now. 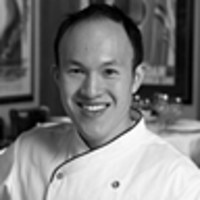 In pursuit of a culinary career, Chan received a degree from Le Cordon Bleu in Paris, and then went to San Francisco to work in the city’s finest restaurants: Kuleto’s, John Frank, and The Fifth Floor. The greatest influence on Jansen came from his work with Alain Ducasse at the Essex House in New York, as well as Mix in Las Vegas and Mix in New York. It was under the tutelage of Alain Ducasse and Corporate Pastry Chef Nicolas Berger where Chan perfected his precise and architecturally inspired technique. He spent more than two years working with Ducasse at ADNY in New York after opening Mix Las Vegas. Following this experience, he joined Oceana’s superlative team in 2007. It may be cold outside but that doesn’t mean you can’t use a little dab of frozen heaven to accompany your next hot holiday pie. Classic vanilla ice cream is a cooked custard of egg yolks, sugar, and cream, flavored with true vanilla beans. That delight, which is named “crème anglaise,” is churned frozen to incorporate air and become this luscious, creamy, smooth invention that we all love to consume by the gallons. It’s such a simple idea that relies on great products and a little technique and it goes with pretty much anything. I find it hard to imagine a world without it. On the flipside, I am grossed out by the commercial products, which is essentially milk, chemicals, and vanilla spun frozen. Those things have nothing on real vanilla ice cream. Get a group together and get your Cantonese fix in the heart of New York City’s Chinatown. Amazing 66. There are so many great restaurants in the world, narrowing it down is pretty tough. Being Chinese American, I am celebrating my heritage with a solid Cantonese style restaurant in New York’s Chinatown. It’s great food and it brings me back to my grandmother’s cooking. There’s nothing like a solid, communal style dinner to bring together friends and family. Learn the sweet secret of the French way in this book from a French culinary God. Grand Livre de Cuisine: Alain Ducasse's Desserts and Pastries. Being a former Ducasse trainee, this book hallmarks classic fine dining (although French style) desserts. It’s crazy to replicate some of these dishes at home, but it gives a benchmark to great pastry making. This is what American cookbooks should be like. For those of you with the insatiable sweet tooth, our friends in France are here to help, one sweet treat at a time. Paris. Part of being a pastry chef means understanding classic French techniques and Paris is the nerve of pastry arts and science. There are a ton of great restaurants and bakeries that are doing classic and modern desserts. Plus, the breads are ridiculous.